“We hope you enjoy this pretty sitting garden” is the welcoming statement on the entry stone. The Sitting Garden provides visitors a place to sit and enjoy the day just steps from the north end of the often-busy Commons. Plants native to North America and some of their ornamental selections are featured in this intimate setting. As the trees mature, dappled shade will add to the garden’s allure. The framework trees and shrubs include hackberry (Celtis occidentalis), shingle oak (Quercus shumardii), and several seed-grown magnolias from the beloved specimens at the Arb. To entice visitors throughout the season, perennials have been chosen for a progression of bloom from spring to frost. One of the firs to bloom, the native columbine (Aquilegia canadensis) is allowed to seed itself where ever it wants. Come, sit, look, and linger. 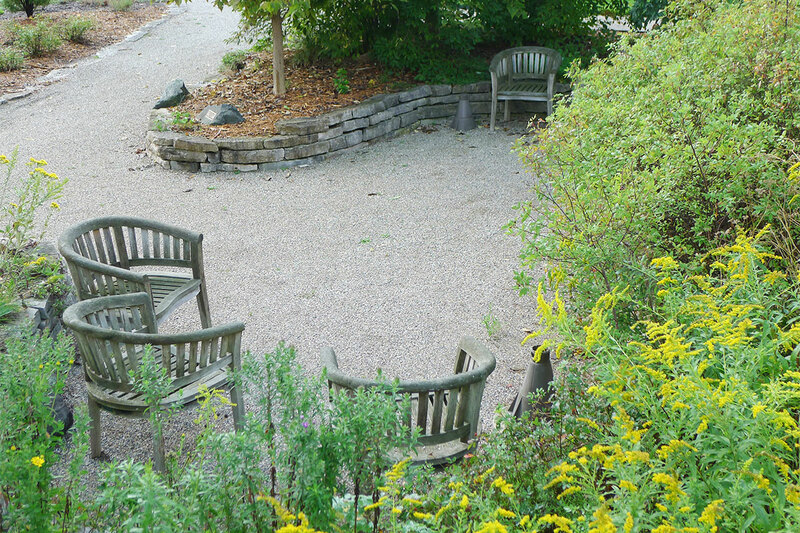 The Sitting Garden is at the Matthaei Botanical Gardens site. This garden was made possible by the generosity of the Helen and Norris Post family. Matthaei Botanical Gardens and Nichols Arboretum needs private support and provides donors with many giving opportunities and recognition. For more details, please contact Meredith Olson, our director of development: merolson@umich.edu; 734.647.7847.